Pyc Fun N Fancy defeating Uptown Dynasty and Hawkeye to qualify for the 2018 Grade 1 $1.2 million All American Derby at Ruidoso Downs. WYNNEWOOD, OK—SEPTEMBER 10, 2018—Pyc Fun N Fancy SI 105, winner of the 2018 Heritage Place Derby(G3), has been retired from racing and will join the stallion ranks in 2019 of Dunn Ranch near Wynnewood, Oklahoma. His fee has been set at $2,500 with consideration. A son of leading sire Pyc Paint Your Wagon, Pyc Fun N Fancy is owned and campaigned by Jose Ernesto Guzman and Rio Sosa. "He is brilliantly fast and he is everything you want in a stallion—looks pedigree and performance," said Matt Dunn, owner of Dunn Ranch near Wynnewood, Oklahoma. "We are excited to add a potentially breed-shaping stallion from the Corona Cartel breeding line, which has proven to be today's preeminent classic sire line. Pyc Fun N Fancy also hails from the female sire-line of First Down Dash, Heza Fast Dash and 2018 leading first-crop sire Coronado Cartel." Pyc Fun N Fancy broke his maiden in the first career start when he posted the second fastest time for the $525,050 Oklahoma Futurity(G3) at Remington Park. 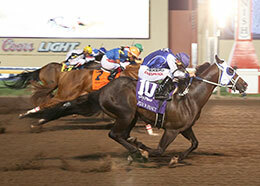 He finished second in the final then won the $61,800 Laico Bird Stakes. 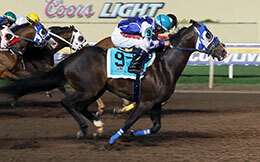 The bay colt was third in the Grade 1 $1.15 million Heritage Place Futurity in his final start at 2. He kicked off this 3-year-old campaign by qualifying for the Grade 3 Oklahoma Derby and was fourth in the Grade 2 Bob Moore Memorial Stakes, facing older horses for the first time in his career. 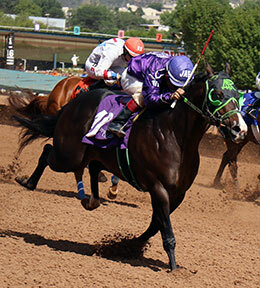 Pyc Fun N Fancy rattled off three straight wins from May through August winning the Grade 3 $363,790 Heritage Place Derby and qualifying for the $1,238,655 All American Derby(G1) at Ruidoso Downs. Pyc Fun N Fancy turned the tables on Oklahoma Futurity (G3) winner Ima China Rush in April 2017, winning the $61,800 Laico Bird Stakes at Remington Park. Pyc Fun N Fancy has won or placed in nine of 12 career starts and earned $478,660 through September 2. "When you think about investing in a stallion, I want them to be athletic, fast and out of a top mare," Dunn said. "Pyc Fun N Fancy has it all." Bred in Oklahoma by Weetona Stanley, Pyc Fun N Fancy is out of the multiple stakes producing Mr Jess Perry mare First Prize Fancy, a sister to Remington Park Futurity(G1) winners First Prize Leesa and First Prize Robin and Heritage Place Futurity(G1) winner First Carolina. Current #3 Leading Sire of Money Earners Heza Fast Dash is a half-brother to Pyc Fun N Fancy's first dam. 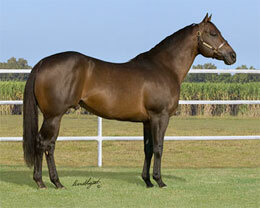 She is the dam of 15 winners, 6 black type including Heritage Place Derby(G3) winner Pyc Fun N Fancy SI 105 (stakes winner to 3, 2018, see above), Remington Park Oklahoma-Bred Futurity(RG3) winner Im A Fancy Pyc SI 92 ($454,765), Jack Brooks Stakes winner Weetonas Lawfawn SI 102 ($123,530 to 3, 2018), Mother's Day Stakes winner First Fancy Prize SI 98 ($113,804), Speedhorse Futurity(G3) winner Fast N Fancy SI 92 ($89,764 ), Florida Derby runner-up Pyc First Prize Fancy SI 98 ($92,303), first-crop stakes sire Pyc First Fancy Lee SI 102 ($57,916), Black Gold Futurity(RG3) finalist Pyc Prize Time SI 109 ($46,369), etc. Three Fancy Socks, a sister toPyc Fun N Fancy, was the 11th highest-selling filly, for $90,000, at the just completed Ruidoso Select Yearling Sale. 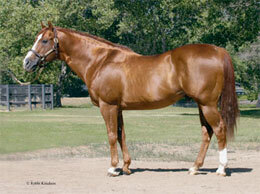 All-Time Leading Sire First Down Dash is a brother to Pyc Fun N Fancy's second dam First Prize Dash. The second dam is former Broodmare of the Year and AQHA Dam of Distinction First Prize Dash SI 101 ($77,465-G1 finalist), a Dash For Cash sister to all-time leading sire of everything First Down Dash SI 105. She is the dam of 28 winners, 10 black type that includes two Heritage Place Futurity(G1) winners, two Remington Park Futurity(G1) winners as well as the current #3 Leading Sire of Money Earners of 2018, Heza Fast Dash. Among the other Grade 1 winners who hail from this female line are Texas Classic Futurity(G1) winner Apolltical Chad SI 95 ($873,655 to 4, 2018), Rainbow Futurity(G1) winner Ms First Prize Rose SI 101 ($550,105), AQHA Distance Challenge Championship(G1) winner Cr Tuckernuck SI 98 ($215,649), West Texas Futurity(G1) winner Fast Prize Zoom SI 112 (192,875). For additional information or breeding contracts to Pyc Fun N Fancy call Matt Dunn at 314-960-3260 or the farm at 580-279-6666.